U.S. AIR FORCE ACADEMY, Colo. — Cadets took the bronze medal at the International Genetically Engineered Machine Competition in Boston, Oct. 24-28. The Air Force Academy cadets won the award with a research project with potential to curb fungal infections often found in bullet or shrapnel wounds and other traumatic injuries. 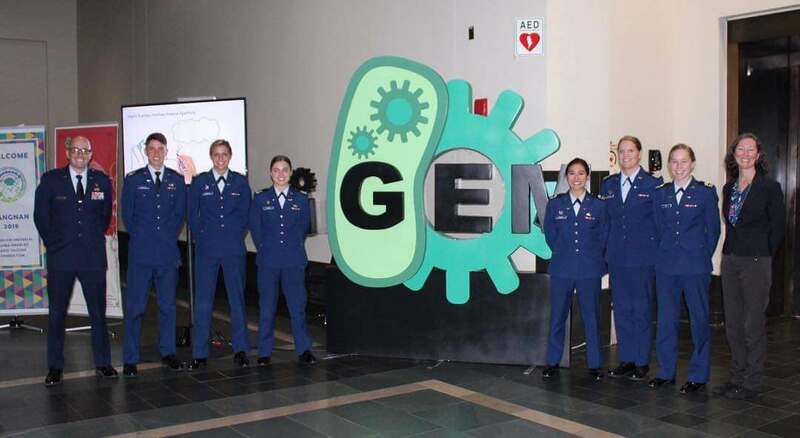 “Our purpose was to try and understand why yeast becomes infectious in the human body, not only because of infections, but because Americans are dying from secondary infections when returning injured from the Middle East, said Cadet 1st Class Annmarie Flatten, one of several cadet researchers who worked on the project. Flatten said it felt great to win the bronze. “These infections are very hard to treat and don’t respond to antibiotics,” she said. Project research took place at the Air Force Academy and the Air Force Research Laboratory at Wright-Patterson Air Force Base, Ohio. The cadets worked with other service academy researchers and students from Colorado State University at Fort Collins and Carrol High School in Dayton, Ohio. This was the first time Academy cadets competed at the event in Boston. More than 350 teams competed, Bates said.